Late-teens-ish worker at fish and chips shack: Great shirt! Him: I love South Park. Him: That episode where the guy in the owl costume molests kids was hilarious! Me: Oh, I didn’t see that one. 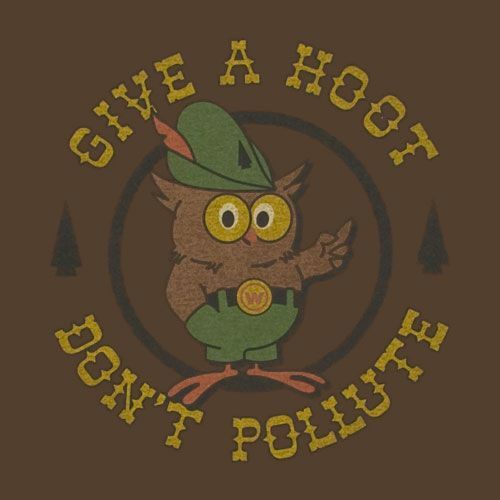 Woodsy Owl was a public service campaign back in the ‘70s and ‘80s who told kids not to litter. Him: Really? Wow, I had no idea it was a real thing! Environmentalists have done a lousy job maintaining or replacing childhood icons. Past generations have had Woodsy, Smokey Bear, Ranger Rick, The Lorax, and Captain Planet, but I couldn't name one who's come along in the last 20 years. Of that list, who would today's kids be able to identify? Part of it is the era - in this age of multimedia ad saturation, campaigns are now run and replaced rather than maintained long enough to reach iconic status. For government agencies, part of it is budgetary - the U.S. Forest Service, which produced Woodsy Owl, now spends most of its money on fighting fires thanks to Congressional budget-cutting and worsening global warming. And for nonprofits, there's the challenge of generationally split audiences. Design a new campaign for today's children and older donors may not be willing to support something unfamiliar. Design a campaign based on an older icon and you may please older donors but fail to connect with today's kids. 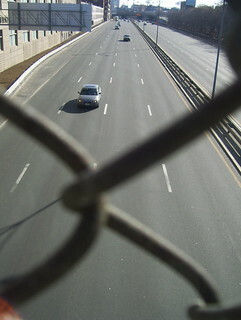 This is Why We're Supposed to Fight for Gas Tax Hikes? As we've discussed before, voters don't want to pay for highway construction, but Democrats are constantly told by Very Serious People that they must campaign for gas tax hikes because it's The Right Thing to Do. Sure, it's nice to put a more accurate price on gasoline, which gets so many free rides, from polluting our air to getting military protection in the Middle East. But if the money is just going to pay for more highways, incentivizing more gasoline consumption, it's unclear if raising the gas tax is even a clear net good, never mind worth progressives spending precious political capital on what's a relatively unpopular cause. I'd rather fight for a millionaire's tax and a carbon tax, wouldn't you?